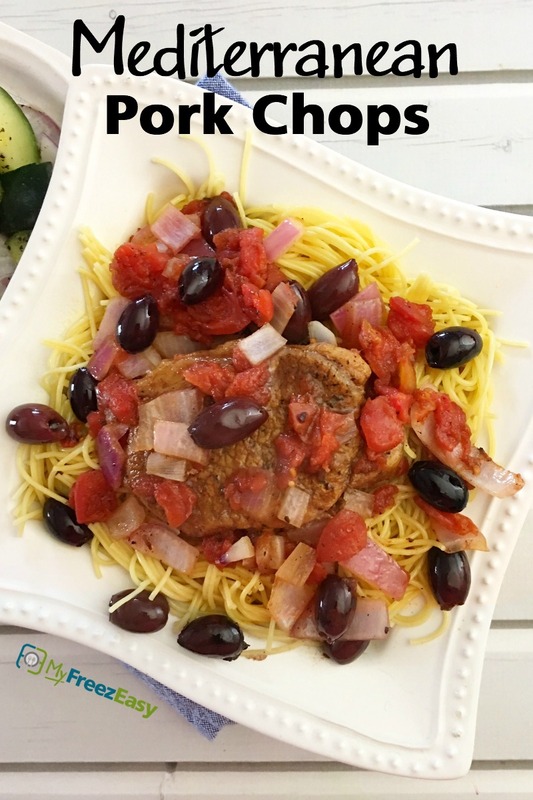 A savory marinade and sauce with great Mediterranean flavors! Goes great with pork chops, chicken thighs and chicken breasts too! In a Dutch oven, add the olive oil and balsamic vinegar and brown both sides of the pork chops. Stir in the diced tomatoes with their juices. Add the diced red onion and kalamata olives into the tomato sauce. Sprinkle in the oregano and salt and pepper to taste. Reduce heat to medium and cook for 15 minutes, or until pork chops are cooked through. 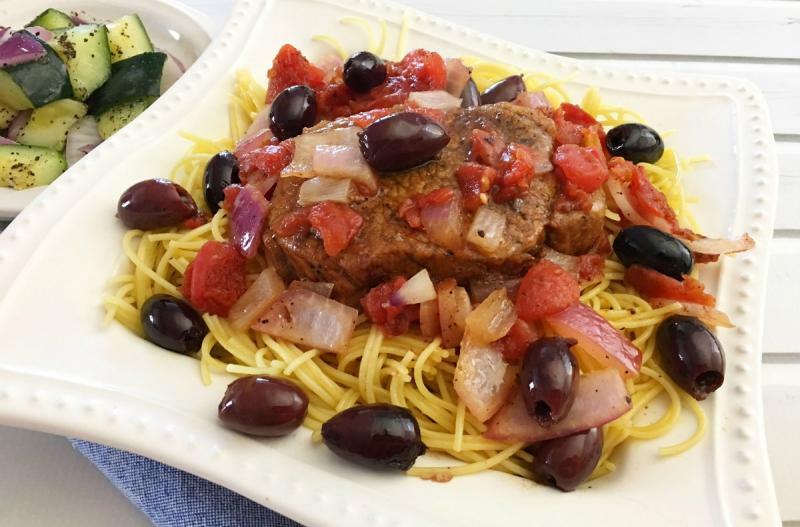 Serve Mediterranean Pork Chops over pasta with veggies. Dice 1 small red onion. Put baggie in the freezer and freeze up to 6 months in fridge freezer or 12 months in a deep freezer. Thaw in the fridge overnight, or a warm bowl of water for about 20 minutes, before transferring to a Dutch oven and cooking the pork chops and sauce over medium heat for 15 to 20 minutes, or until pork chops are cooked through. Serve with gluten free, Paleo/Whole30 side dish, for complete GF or Paleo/Whole30 meal. Recipe is gluten-free when served with gluten-free pasta, or other Paleo side dish like cauliflower rice. Thaw and cook pork chops and sauce in Dutch oven for 20 minutes, or until pork chops are cooked through.